Andean Trails’s Tom shares his overnight experience on the floating Uros islands, Lake Titikaka. After the warm Aymaran welcomes, my first impression of standing on a Uros floating reed island was one of sponge meets swamp. These unique people and islands now offer overnight homestays, allowing guests to sleep bobbing on a totora reed island in the middle of Peru’s Lake Titicaca, or Titikaka. Of the 89 Uros islands, my home was Wiñay Totora. This is an organic, floating residence to five families, a cat and her four kittens plus the occasional tourist – all nestling into an island the size of half a football pitch. Conditions are basic: no running water (the locals drink from and bathe in Lake Titicaca), no showers, a basic toilet and a rudimentary mattress with blankets. All encased in a reed hut, with some blankets and plastic sheets that rattle in the incessant wind. There is a slight movement when the wind is strong or a boat passes, but other than the small risk of an occasional soggy foot as you plant it through the fibrous floor, it’s easy to forget you are floating on water. The Totora plant, a papyrus, forms all life on the islands. The root is a light, cork-like substance that floats – in huge sections up to 10m2 – to the surface of the lake during the rainy season (Dec-April). This forms the base of the islands, with the root cut into pieces several pieces then meshed together with nylon twines and eucalyptus stakes. Later, totora reeds are laid in a mesh fashion on top of the floating base, forming an island that can last up to 30 years. It is anchored with stones to the lakebed, to prevent it moving, and can take a year to make each island. Before nylon was used, islands only lasted a few years. The Totora plant is also rich in iodine and the inhabitants eat it as their staple food, along with fish and bird eggs. Cooking is done on fires on top of stones, and meals consist of soups, trout and the occasional hunted bird, or its eggs. When the rains come, the totora reed absorbs a lot of the water, but it still drips through and many houses are now adorned with corrugated plastic or iron roofs. Everything is a work in progress, with piles of reeds left drying, other being sorted and selected and others being used to mend holes in walls and roofs – and of course the floor. Families are friendly, always smiling and often joking, and we huddled around a reed fire they lit for us, exchanged songs and stories about our lives and families as we sheltered from the cold Andean wind. It’s hard to imagine what a year is like here, as really the islands are small and yet rocking Puno is always on the horizon. There is something ephemeral about the existence, but it shows no sign of disappearing. Day tourists come and go, filling a hectic hour in the morning for islanders, giving them a chance to sell some reed souvenirs or intricate weavings. By staying overnight, we learnt how these skills (not easy!) 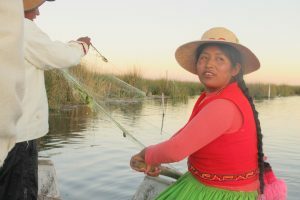 and just how the 2,000 islanders survive – fishing and gathering the eggs of the 70+ bird species that inhabit Lake Titicaca. Uros folk also dig holes in their islands to fish – Inuit-style on the ice – through the ground they’ve built. The lake provides drinking and bathing water for everyone, as well as shelter from the cold winds and nighttime temperatures. The totora root filters any detergents that the islanders throw onto the reeds. Originally, the people came to live here some 2,000 years ago, living in reed houses on reed boats to escape being enslaved by the dominant Tiahuanaco culture. Nowadays, there is a primary school to which the kids row themselves every morning, and a basic hospital, with the mainland only an hour away by boat. Solar panels have given people the chance to watch an hour or two of TV at night, but the same basic rhythm persists. Alex said: “We wake at 3 or 4am, and go fishing, collect the nets we laid out the night before. Later in the day, we cut some reeds and sort them, so we can keep the island in good repair. “We work hard every day and go to bed early, around 7.30pm, with the whole family sharing one or two beds. Lake Titicaca’s statistics are impressive. It is the world’s highest navigable lake at 3,800m (12,500ft), some 8,560 sq km, with depths of up to 280m. ‘Titi’ mean puma in the pre-Inca language Aymara, which the Uros inhabitants speak today. ‘Ka ka’ means blue/grey in Quechua, the Inca language, to represent the colour of the cold waters, typically 9 degrees. Five glacial rivers flow into the lake, but only one – the Desaguardes – flows out and marks the Peru/Bolivia boundary. It’s not possible to cross from Bolivia to Peru by boat, you must take the 3-hour bus between lively Puno (Peru) and laid back Copacabana. We loved staying on Amantani Island in Lake Titicaca with a local family. We were very lucky as the youngest daughter, a student nurse, was home for the weekend and could speak English which was a real bonus. We learned so much about the local culture, farming methods and their lives. The floating islands were amazing as well.